Kachori is a common snack in various parts of India,including UP,Delhi,Rajastan,Maharashtra,Gujarat etc. It is one of our favorite snack from Chopatti. Chowpatti is a Marathi word with the meaning 'beach'. In India we can find tasty snacks in small shops called Chowpatti at the beach sides and road sides. Mix 1 cup Maida ( Plain Flour) , 1 tsp salt and 2 tabsp oil into a crumbly mixture. Add water slowly and make a dough , not too soft. Keep it for 1/2 hr . Crush Moong bean, fennel seeds,coriander seeds,ginger,salt, mango powder,chilli,hing together in a mixer/grinder . Now heat a pan ,add 1 tabsp oil . Roast the filling to remove the raw taste.add 2 tsp water to the mix and keep aside for 5 minutes. 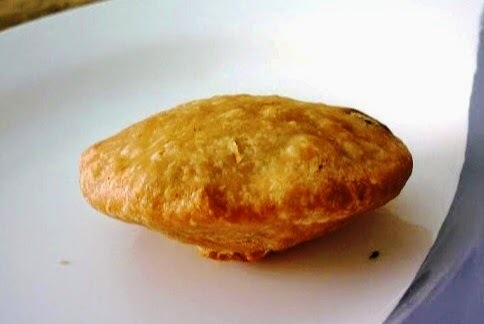 Now make small puris , place a spoon of filling , and enclose the puri ,make it as a dumpling.Gently press the dumpling and give a kachori shape. Fry on medium heat .It will come out puffy , then turn it carefully to other side. Remove onto absorbent paper and serve warm along with a cup of chai.